Private functions at Rustic Ridge Ranch. to host private functions such as weddings, family "get-to-gethers" as well as Christmas parties. 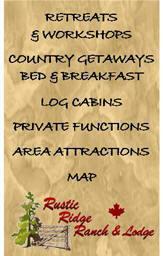 Rustic Ridge Ranch and Lodge can provide you with the the warmth and comfort of home in a rustic setting. 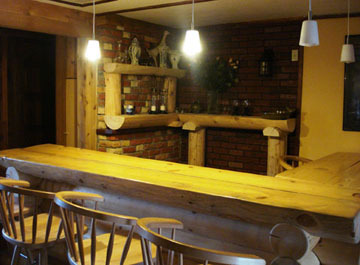 Enjoy coffee around our wood stoves, the scenic view from the deck, or relax in the hot tub. to "tickle" the electronic ivories and pick their favorite tune. Cross Country Skiing (equipment not provided). Ask about snowmobiling and horseback riding. 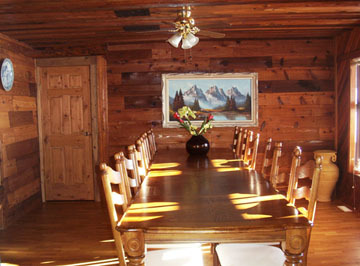 The Rustic Ridge Ranch & Lodge dining room area can accommodate small and large groups. and relaxed while dining at the Rustic Ridge Ranch & Lodge. 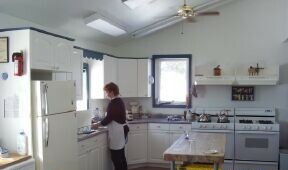 Overhead ceiling fans are in place for your comfort. The Place to Reconnect, Relax & Leave Revived!